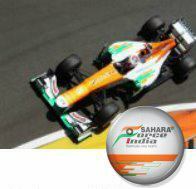 Sahara Force India came away from Singapore with a hard-earned point as Adrian Sutil finished tenth on the streets of Singapore. Adrian Sutil: "It was a tough race and exhausting in the end. So it feels great to come away with a point and it's a small motivation for the whole team. In the closing laps of the race I was catching the train of cars in front of me - Perez, Button and Hulkenberg. I thought I had a chance to get ahead of at least one of them, but as soon as I reached the back of the train my tyres went off. In fact, we were all struggling with tyres and I couldn't attack anymore because it felt like driving on ice. So I'm happy to take the point and it's well deserved by the whole team." Paul Di Resta: "It's such a shame to come away with nothing to show from a race where we had put ourselves in a position to score some valuable points. The management of the tyres was good and the overall performance in race conditions was very strong. Even without the safety car we were in good shape, but as a team we made the right calls and were looking to challenge the train of cars ahead of us in the final few laps. Then I had the incident at turn seven. I'm still not sure what happened, but I took the corner the same way as I had done the previous lap and the car went straight on and wouldn't stop. The team is investigating what happened." Dr Vijay Mallya, Team Principal and Managing Director: "We come away from Singapore with mixed feelings. The positive is that Adrian picked up the final point and that's a good effort considering where he started the race. On the other hand we missed a golden opportunity to score some big points with Paul, who potentially could have finished in sixth place. His retirement with seven laps to go proved costly and has not helped us in our battle against McLaren. As a team we must focus on the positives of the competitive race pace, good tyre management, and the calls we made with the strategy. Korea in two weeks' time will be a chance to regroup and keep up our fighting spirit."